Precision Fermentation welcomes you to our new blog. Over the coming months, we’ll announce the availability of the BrewMonitor System – real-time, comprehensive fermentation monitoring – to help brewers gain more control over their brews, improve repeatability, and increase efficiency through the fermentation process. How traditional, manual fermentation management impedes creative and efficient brewing. 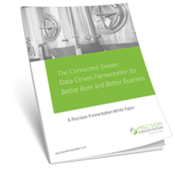 What fermentation data a brewer needs to make informed decisions about current and future batches. How streaming live data from your tanks empowers your brewing company: control, repeatability, efficiency, and production capacity. The business benefits of real-time fermentation monitoring to help grow your business.